Since Wednesday, I knew in my mind what was going to happen at the game on Friday. I was going to score a try while properly executing a handoff, thus making myself useful to my team. Then, I was going to go and get my hair done and go to the Snug and celebrate the game with the rest of the team. I was not going to sit in traffic on the Corniche with an ice pack on my shoulder en route to an Egyptian hospital. There was barely a minute left in the match and our team was all feeling done in. 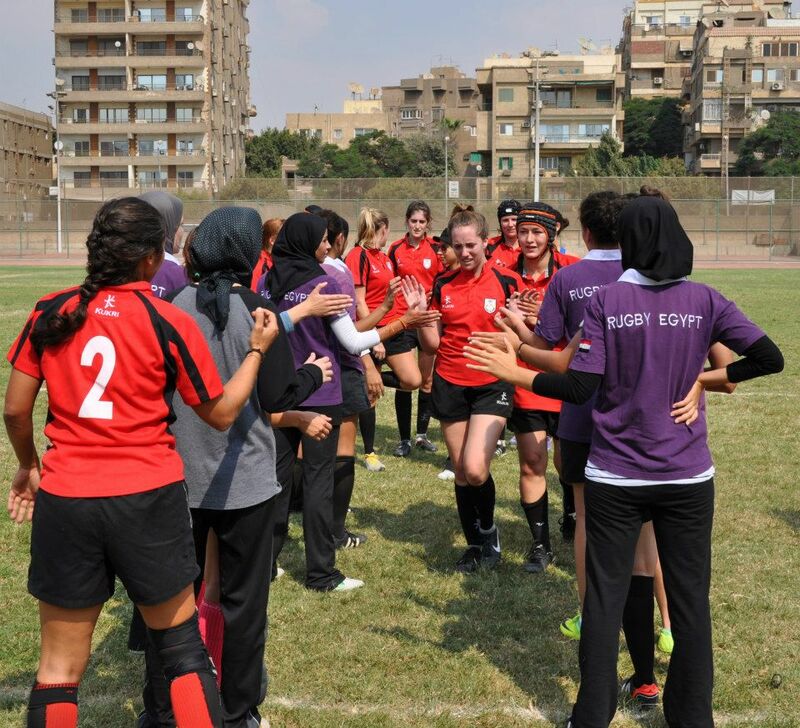 If you think a rugby match at 1:30 in the afternoon is unforgivably hot, imagine what a rugby match at 1:30 in the afternoon in Cairo is like: it felt like we were playing in a microwave. 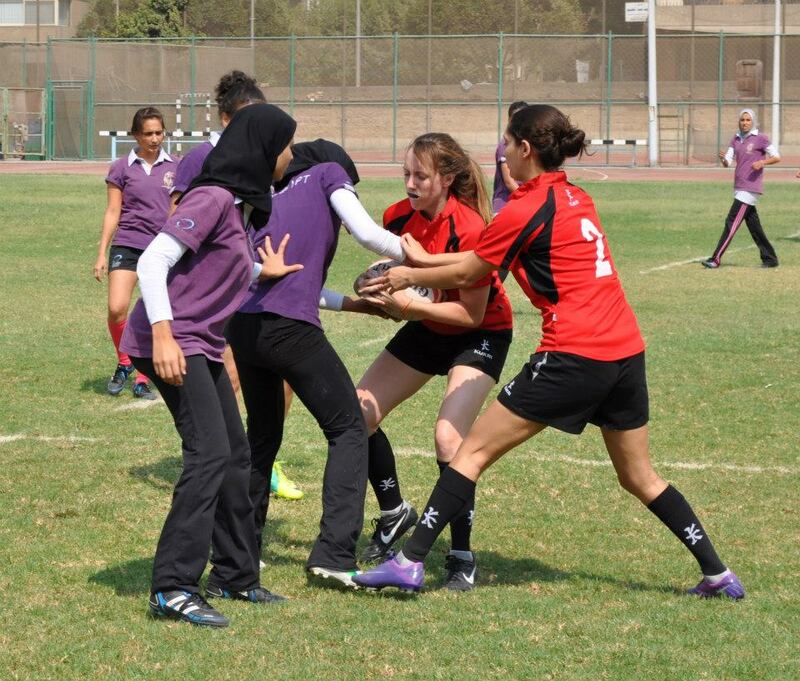 The Alexandria team scored two tries easily in the first half, so we stepped up the defense toward the end. I was – as always – immensely proud to be a part of such a solid, encouraging team of girls, sweaty and panting but always persistent. I got the ball and started my sprint to the try line. Miraculously, a gap opened up in the defense and I easily tore through it. I could see a girl running toward me on my right, but I was positive I was going to get this try. 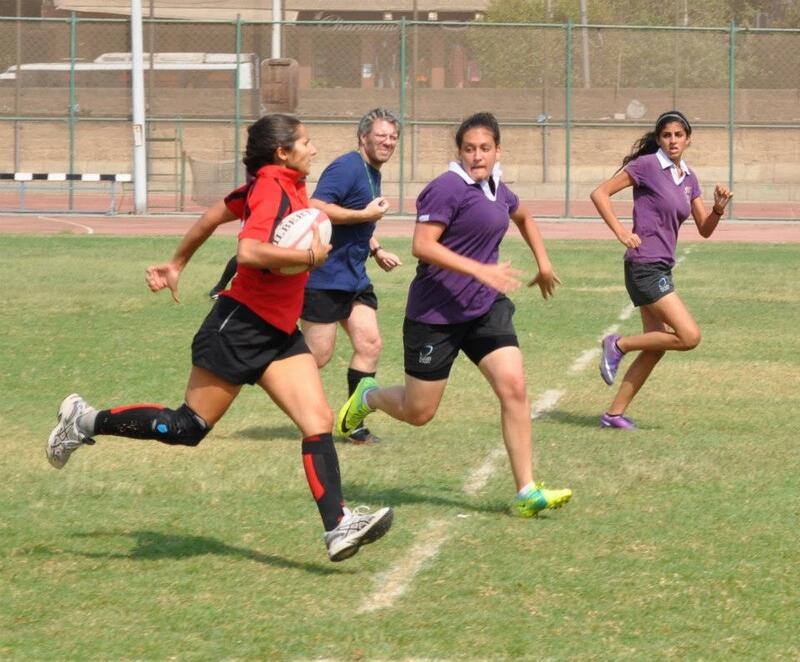 Bolting for the try line, I began to slow down to place the ball on the ground. I don’t know why I didn’t dive. But instead of feeling okay, I felt disoriented. I somehow pulled myself to my feet and staggered around the side of the pitch like a drunk while my team attempted to clean up the mess I’d made. When I finally gathered my bearings and realized I was crying and breathless and my shoulder was experiencing a searing, paralyzing pain, I turned to ask for a sub only to find our teams lined up for the “tunnel,” signaling the end of the match. We lost 2-0. A picture of defeat…or extreme toughness!! Zow! Finally, Lilia resolved to take me to the hospital. At this point, I was rapidly switching between staring dazedly into space and bursting into sobbing fits. I called Simon to bring my insurance cards and meet me at the hospital and replayed the scene over and over. If I had gotten the damn try, the endorphins would have outweighed the shock. And I sure as hell wouldn’t have been crying. She is a paragon of both intimidation AND consideration. We arrived at the hospital and I was immediately put into a room. Now, I hate hospitals to begin with. And needles. But imagine yourself in a hospital in a country where white cream is the solution to everything and most doctors don’t wear gloves. Add to that the terror of not knowing what’s wrong or broken, and you’ve got yourself a mighty disheartening situation. Lilia went to fill out some forms for me while a doctor prodded my neck and asked me to lift my arm. The nurse jotted some information down. “I was playing rugby. I got tackled,” I managed. “No, something…something…” I pointed at my shoulder. The nurse returned with Lilia and a needle. Lilia, God bless her, insisted I’d be fine with a big ol’ smile on her face, lapsing into French to explain to me that I was getting a shot in my bum. It took a combined effort for them to break through my shorts and underarmor and inject me with two minutes worth of painkiller. Seriously. Talk about a huge needle. Lilia took care of my insurance when Simon arrived, trying to console me. The three of us – me demoralized and confined to a wheelchair – were taken upstairs to the x-ray room, to the chagrin of the handful of Egyptians who had been waiting for much longer. They shouted in Arabic at us as I rolled by shamefully, committing the double offense of cutting and wearing shorts. “No.” He stared at me, puzzled, before going to get a doctor. We were then relocated to a room downstairs with a bed. Panic set in again at the thought of having to stay the night. “No, no! You won’t have to stay,” Lilia and Simon both reassured me. I sat nervously on the bed beside Lilia while Simon eyed a box of latex gloves at the bedside. “I could use these for work,” he said, grabbing fistfulls and shoving them into his pocket. The orthopedist entered and showed me the x-ray, which now displayed two small, red arrows pointing at a fractured bone. Diagnosis? 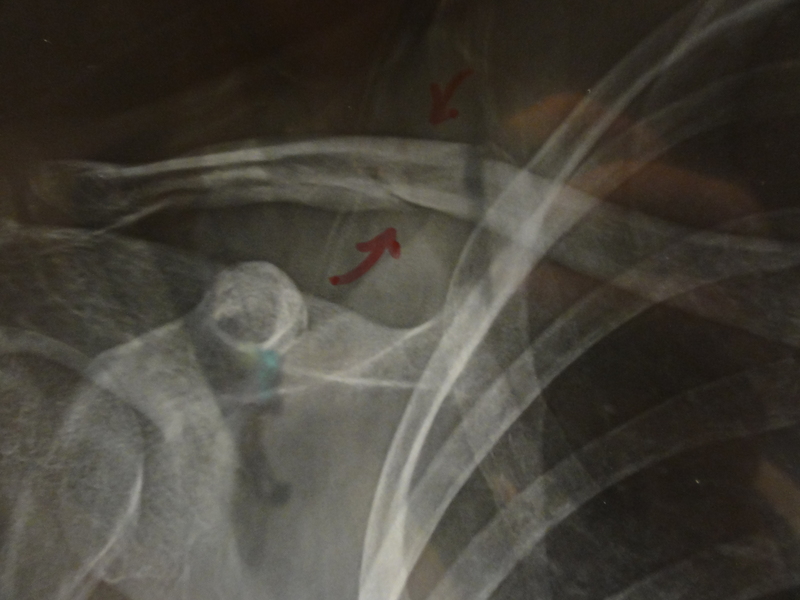 A fractured clavicle. Healing time? Six weeks. In a sling. On my dominant side. At this point, I was just grateful it wasn’t a break. And equally grateful for Lilia and Simon. My head was still not on straight, and Lilia knew all the questions to ask. Alternative options (an operation to insert a blade into the bone), length of time in the sling, follow-up appointments, etc. All in all, we were in and out in under two hours. As we left, Simon exhaled. “Good. I thought you were gonna have to stay the night,” he admitted. With that out of the way, Lilia and I went back to my flat where she had to help me remove the torn jersey and my sports bra – thank God they came off without scissors – and I was able to take a semi-shower. And then, in true fashion, we headed to the Snug for the after party. It was there that I learned how many of the men had broken their clavicles, with one describing how his bone penetrated the skin. “Ah, clavicle. That’s a good rugby injury,” the men’s coach said, apparently slightly more at ease regarding the torn jersey. As the night wore on, I felt a bit merrier, with my teammates reassuring me that the try counted to them and wishing me well. Some of the girls who were away at the beach sent me texts wishing me well, and the general morale among the men and women’s teams was uplifting in itself. But still, I couldn’t shake the unceasingly irritating feeling that I had failed, that I hadn’t even scored the try. Peter informed me that I was a mere few inches away, which made it even worse. I enjoyed the company and the parties, but I still couldn’t shake it. Then I remembered something Kilian told me in Dahab about the first time he went abroad, to Mali. He told me how he used to analyze all his mistakes in rugby and, frustrated, replay the scenarios over in his head, berating himself over what he did wrong. But when he got off the plane in Mali and saw the amount of people sleeping in the streets and the pervasive poverty, he realized that his worries, in comparison, were just frivolous. I’m not sure why I thought this at that moment, but it hit me, and I have since moved on. Instead, I focused on the outpouring of support and friendship from my teammates and friends. Arriving home later that night, I found two tupperwares of cut up fruit in my fridge. I have far too much to be grateful for to marinate in self-pity and remorse over a silly mistake. I hope that I can embrace this gratitude every day despite the frustrations that come with having one functioning arm. I’m back – and I come bearing soup! WOW captivating read!! Better luck next try! Get well soon!